A delicious dip built around roasted fennel instead of eggplant. My thinking here was simple: what would happen if, instead of eggplant, roasted fennel was transformed into baba ghanoush? Turns out: magic. I made some early versions with fennel alone which, while perfectly edible, lacked both body and something to tie the sweet and aniseed flavours together. Adding the traditional tahini to this baba ghanoush only overwhelmed the delicacy of the fennel. The solution was almonds, whole, roasted and blanched (that is, without their skins) scattered onto the tray of roasting fennel for a few minutes to bring their flavour to life. Everything is tumbled, along with a couple of other flavourings, into a blender and pureed. In the process, the almonds flavour the dip and absorb some of the fennel's liquid, swelling a little to deliver great texture as well. Cook's tip: The almost universal horror of anchovies does them no justice, and when they're good they're spectacular. I use the fat Spanish anchovies packed in olive oil; you don't detect them at all in the finished dip other than the depth they bring, and I've found it's better not to bring up the subject at all. For a strictly vegetarian version, be a little more generous with the black pepper. 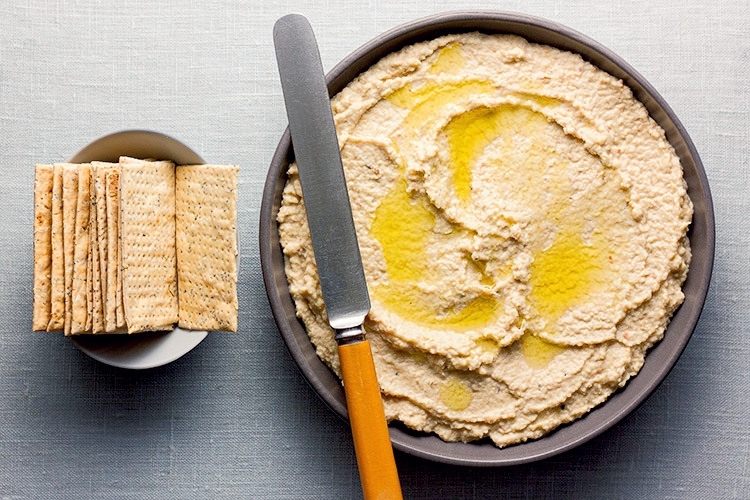 Serve this as a dip however you like: pita, crackers, corn chips, crudites, whatevs. I can't tell you how good it is dolloped on a grilled lamb cutlet. Oh, wait – yes I can: it's sensational. Trim and cut the fennel into about 6 chunks. Don't worry if it falls apart: it's all going into a blender. Toss with a little olive oil on a baking tray. Add the whole cloves of garlic and roast for 20 minutes. Scatter the almonds onto the baking tray for the last 5 minutes of the fennel's cooking time, just to warm them up and help unleash their flavour. Remove the tray from the oven and let it cool a little, then transfer all the fennel, garlic and almonds, along with any liquid on on the tray, into a blender or processor. Add the juice of half a lemon and the anchovies and blend until smooth and finely pureed. Taste, seasoning with salt and pepper and more lemon juice as required. Transfer to your serving dish. While it's perfectly fine to eat straight away, its flavour will develop with a little time. It will happily sit in a cool place or the fridge until needed. Let it come to room temperature and drizzle with extra virgin olive oil to serve.